Crocker Chief Curator Scott Shields describes Mark Bowles’ paintings as “subjective, reductively simple, and filled with blazing light and color.” Mark calls the body of work he is presenting at The Temp in October “eclectic.” We call it “breathtaking” and we look forward to sharing it with our patrons. SIXTEEN SIXTEEN: You are a native of San Francisco. How did you end up in Sacramento? Bowles: I'm actually a native of the East Bay (Orinda). It really had to do with economics. Sacramento was inexpensive and my wife and I knew we wanted to start a family and to have one parent stay home with the kids. So I stayed home with the kids and painted while my wife worked in the corporate world. SIXTEEN SIXTEEN: And, since your art is shown all over the United States, what keeps you here? Bowles: It's really quite simple - it's family. I have my two daughters here and my chosen family which is all my friends. Moving away from those things that I love would be too hard. I leave in the winter to paint where I have complete solitude but I stay in touch all the time. SIXTEEN SIXTEEN: Most people know you as a landscape artist. Is that how you see yourself? Bowles: I do, I see nothing wrong with being a landscape artist. I think I work between abstraction of the landscape and representation of the landscape. I think that's how and where people can meet and join in a painting because we all have experiences in the landscape. What one person sees in one of my paintings can be very different from what another sees in it. And since the landscape is always changing with light, color, season and travel, there is always a new reference to paint. SIXTEEN SIXTEEN: Last month you participated in the "Break Out" show at The Temp. In fact, that show was your idea. Tell us about that experience and what you learned from it. How did it change your art? Bowles: Well I learned a lot. It was a fun show. I chose to do sculpture because as a painter, it was a medium or discipline I hadn't explored in a long time. When I started the project and decided I wanted to do sculpture, my ideas were based on what sculpture I wanted to own but then I realized I was only regenerating someone else's thoughts; their work and art doesn't come from that. You can't skip the process in making art and just come to a final product or image. So I had to start from scratch several times – what I ended up doing was gathering personal objects that meant something to me and assembling them into a sculpture. That is how I felt complete in this project and the process of how I relate to sculpture. How did it change my art? That's simple. It just made me rethink all the principles that go into making a painting; the assumptions we take on, the history we carry and what a finished piece of art is. SIXTEEN SIXTEEN: How has your color palette changed over the years? Are there colors that you refuse to use, colors that you enjoy using? Bowles: My palette changes constantly. There are no colors I refuse to use. I call what I do a nice bandwidth of preference that I paint from, that is the whole spectrum. Part of why I do that is setting up challenges for myself, so if I decide to work in just a hot palette, that's a challenge. If I decide to work in a blue palette, that's a challenge. I don't want to be pigeon-holed as an artist or turned into a production painter where I have to turn in the same work over and over. I find that I'm very influenced by the seasons here in Sacramento and the changing of the light and color. I do like the heat more than the cold so I'm drawn to that color palette. When you hear artists talking about the color of the sky changing from places like Santa Fe to Tucson to Carmel to Sacramento to Tahoe, it's very true in that the light from the sky and how it affects color is very different. All of these factors influence an artist's palette. When I am in the desert painting in the winter, my palette changes, just like what I just experienced here in the last two weeks -- the light here in Sacramento has changed to Fall light. 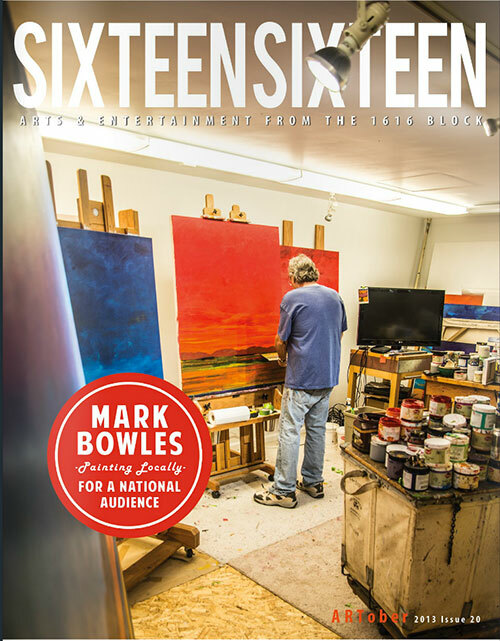 SIXTEEN SIXTEEN: You are the rare artist who has been able to claim "artist" as your real job, your profession. If you hadn't been an artist, what career would we find you pursuing? Bowles: There is no other career I would be pursuing, if I hadn't been an artist. I have always wanted to be an artist, a painter, nothing else. I think I'm very lucky but I also know that I work very hard at what I do. Being a professional artist involves more than just painting. Just like running any business, there's more than meets the eye. There's marketing, inventory, billing and shipping, the list goes on and on. The one thing I have learned though with my galleries, the ones I decide to stay with, it has to do with relationships, not just sales. I really enjoy the people in the galleries I work with. But I can honestly say there is no other career I would rather do or that even comes close. There are plenty of careers I wouldn’t want to do. SIXTEEN SIXTEEN: What should we be looking for in the body of work you'll be presenting this month at The Temp? Bowles: This is a pretty eclectic showing of work from about 2007 to 2013. I wanted to show the bandwidth of what I do, some are certainly more abstract in a sense and others are more representational with the palette all over -- I thought that would be interesting to see. I think each painting most likely represents about 10 paintings I have done in that vein -- again the bandwidth of what I do. I like to be exploratory, not just focused on one view of the landscape and one description. I think the work collectively just states what I am about as a painter.